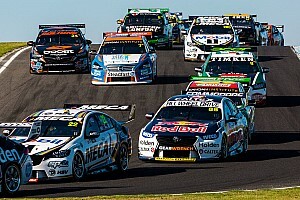 Jamie Whincup led an all-Holden top five in the final Friday Supercars practice session at Symmons Plains. The two Red Bulls set the pace early, Shane van Gisbergen going quickest with a 50.961s on the four-minute mark, only to be immediately knocked off by Whincup's 50.912s. 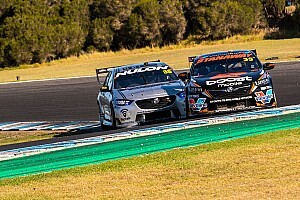 Seconds later Simona de Silvestro staged the most dramatic moment of the session, dropping a right rear coming onto the main straight and looping her Nissan Altima a full 180 degrees without hitting anything. 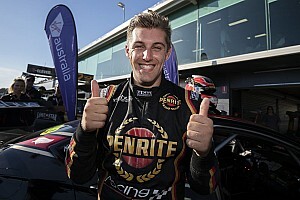 Chaz Mostert briefly moved into second around the 10-minute mark, before van Gisbergen improved to a 50.923s to restore the Red Bull one-two. At the midway point Scott McLaughlin took over at the top thanks to a 50.886s, which lasted five minutes until Scott Pye went quickest with a 50.813s. Mark Winterbottom enjoyed a brief spell at the top inside the last five minutes thanks to a 50.690s, which was topped by van Gisbergen's 50.654s with two minutes to go. Whincup wasn't done there, though, hitting back with 90s to go with a 50.508s that broke his own unofficial lap record to top the session. "The car is good. 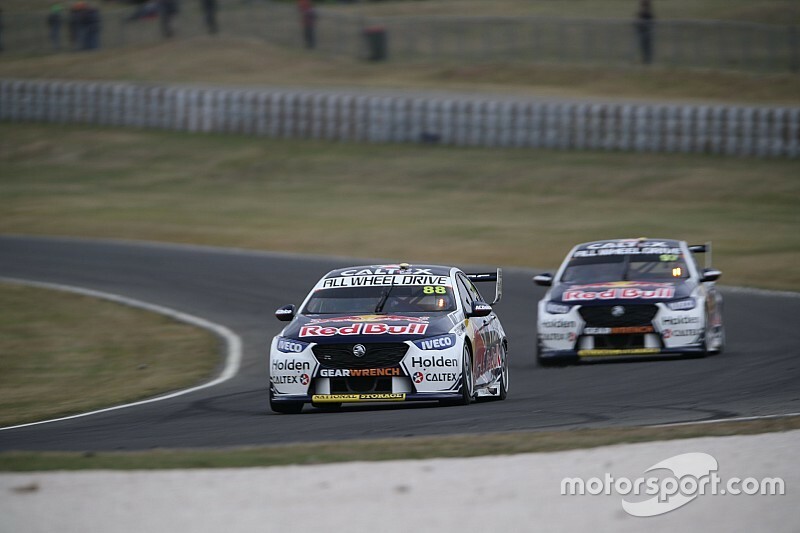 [Engineer David] Cauchi made a couple of gains then in P2, we're there or thereabouts," said Whincup. "Here the last couple of years have been really good, with the dual springs you can get the best of everything. 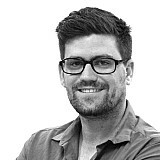 Whereas maybe I'm asking for a bit too much, it's nowhere near as good as what it was on the 'dualies'." Van Gisbergen ended up second, moving to within 0.01s of his teammate on his last lap, followed by David Reynolds and Winterbottom. James Courtney capped off the Commodore top five, with Mostert leading the Mustang charge back in sixth. Penske pair Scott McLaughlin and Fabian Coulthard were next, Todd Hazelwood banked himself a Q2 spot with ninth, while Will Davison rounded out the first 10. Nick Percat was the unlucky driver on the Q1/Q2 bubble, the Brad Jones Racing driver missing out by a hundredth. Despite being fastest with 10 minutes to go Pye will have to go through Q1 after being shuffled back to 12th, while Mustang drivers Lee Holdsworth and Cam Waters will have to go the long way too after finishing up just 14th and 20th respectively. All four Nissans will have to go through Q1 as well, Andre Heimgartner the best of the Altimas in 13th.